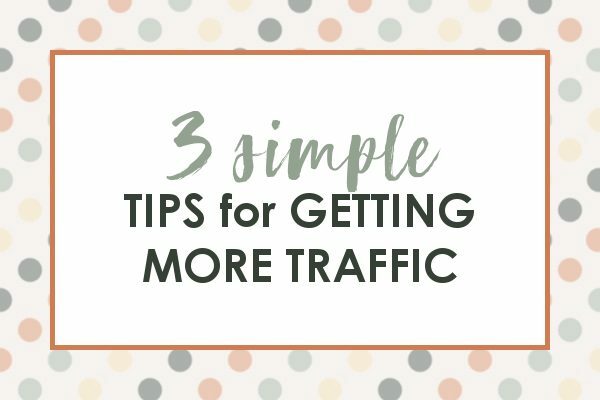 3 simple ways to bring more traffic to your site TODAY! Don’t wait for people to find you, get more page views for your amazing content right now. Page views are king! Or at least they are in the beginning of your blog’s life. So finding ways to get more traffic to your blog is important. While there are other long term techniques to bring traffic to your site, these are a few ways that will help you get more traffic TODAY! While I don’t claim to be an expert on driving site traffic, I have seen large growth on my blog this year. In fact, my traffic is more than 500% up from where it was in August of 2016! But that (usually) doesn’t just happen by chance. Here are my favorite ways to bring in new readers to my site (keeping current readers is different and we will talk about that later!). Pinterest is fickle. Don’t hitch your wagon to the traffic you get from Pinterest, because the platform will suddenly change and you will be left in a lurch! Having said that, it is one of the FASTEST ways to grow right now. And the best way to do that is by joining group boards. Find a large blogger in your niche and check out their Pinterest profile. You will be able to see which group boards they are on… visit any group boards that apply to your content and contact the board own in the manner specified in the board description. Once you are invited to a board, make sure to follow the rules of that board (again, check the description), and you will have drastically increased your reach! Pin as often as the board allows and make sure you vary your content (don’t spam the same pin over and over again). Tip: Make sure your pins are loooong. 600px by 1260px is a good rule of thumb. Photos should be clear and text should be easily readable. People are scrolling fast, so you don’t want them to have to work to read your content! I use Tailwind for the SmartLoop feature on all 3 of my blogs and I HIGHLY recommend it if you don’t want to be very hands-on with Pinterest. So I just set up Tailwind to do it all for me! Try it free for a month! Another social media network that can change at the drop of a hat. However, the approach to Facebook is a bit different. With this platform you are going to be connecting directly to other bloggers who will then share your content with their audiences (and you will share theirs). Search for groups within your niche and ask to join. You may want to do a Google search for your niche (i.e. “Homesteading groups on Facebook”) in addition to searching on Facebook. Most times you will be able to easily find support groups and share groups for your content. When I was first starting out share groups brought in 75% of my traffic! When she started really working her blog she decided that she was going to have 10,000 page views by the end of 30 days. Guess what? She did it in 29 days!! And her page views have just gone up and up ever since! I’ve read this book and I learned so much that I was able to apply even to a well established blog! Many of you already know how to monetize your blog the right way, so with the extra page views you’ll get from this book it will pay for itself in less than a month! Check it out here and explode your page views today!